Tsunoshima is an island located in the Sea of Japan. Located in the north west of Yamaguchi Prefecture, it is a part of Shimonoseki city. The island has an area of 4.1 square kilometers (1.6 sq mi) and has a coastline of 17.1 kilometres (10.6 mi). The island consists primarily of basalt, and is a part of the Kita-Nagato Kaigan Quasi-National Park. As of 28 August 2008, the population of Tsunoshima stood at 907. Once separated from Honshu, Tsunoshima is now accessible via the 1,780 metres (5,840 ft) long Tsunoshima Bridge, which was completed in the year 2000. 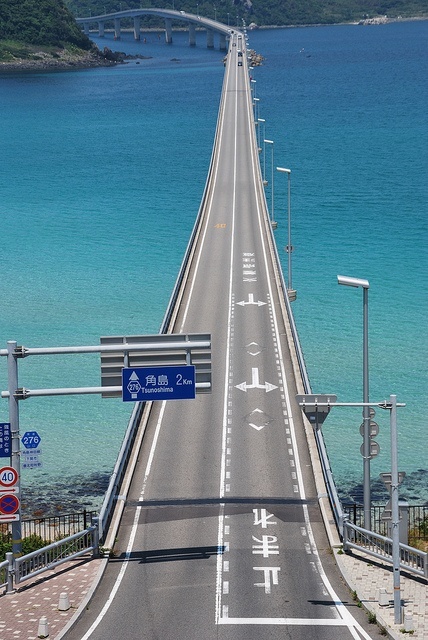 At the time it was the longest toll free bridge in the country, though the completion of the Kouri Bridge in Okinawa prefecture pushed it into second place. On the north west of the island is the Tsunoshima Lighthouse, which has come to be the symbol of Tsunoshima. Before the war, Tsunoshima contained a military site of the former Imperial Japanese Army. To this day a part of this still remains.